Researchers at the University of Roehampton Musculoskeletal research group used MSR145 data loggers with tri-axial accelerometers to record signals during a fall of the human body. It is also possible to detect falls using the accelerometer of the phone, but this requires the user to have the phone attached to the waist of the body at all times which incurs the obvious problem of the user forgetting to keep the phone on the waist. 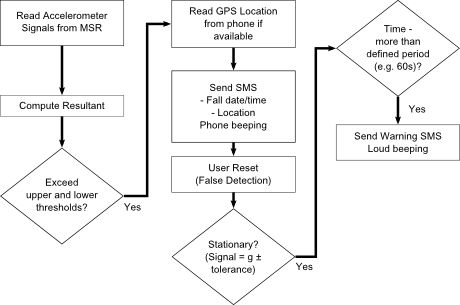 False alarms might occur if the phone is dropped compromising specificity and sensitivity. Therefore using an external accelerometer, like the MSR145 datalogger, may be a better option. In fact, the researchers found the acceleration signals from the MSR145 had a higher accuracy than those from the embedded accelerometer inside the phone. Full details of the research study can be found in the scientific publication in the journal Age and ageing. We have supplied MSR products in the UK for many years and numerous Universities are amongst our clients [Cambridge, Essex, Liverpool, Manchester, Nottingham, Southampton, York, in addition to Roehampton].